Epithelial basement membrane dystrophy (EBMD) is the most common type of corneal dystrophy, affecting 2% of the population. Although the majority of patients remain asymptomatic or experience minor episodic subjective discomfort, about 10% will eventually complain of recurrent erosions and/or visual disturbances. [1,2] The clinical course is often biphasic: Recurrent epithelial erosions predominate in the early phase, and visual disturbances occur in the later phase. The pathophysiologic hallmark of EBMD is an abnormality in the formation and maintenance of the epithelial basement membrane adhesion complex of the corneal epithelium, a phenomenon that accounts for the recurrent erosions that are associated with this disorder. 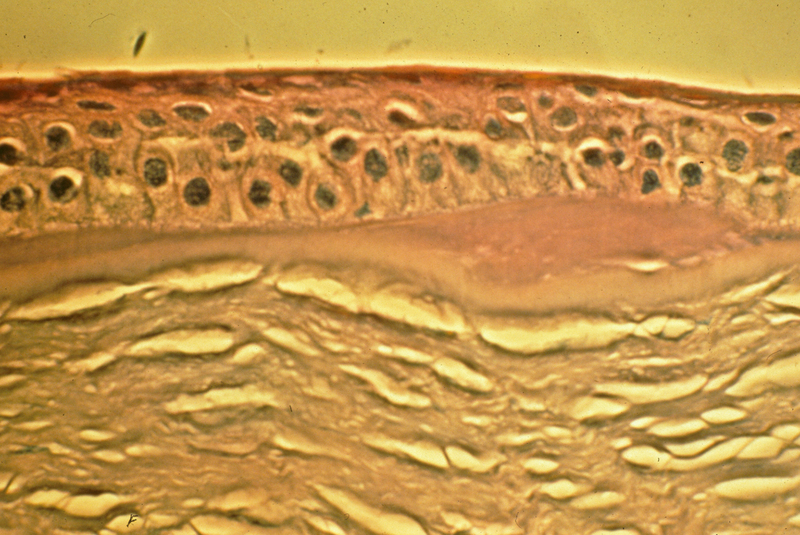 Originally described by Hansen over a century ago, and further characterized by Thygeson a half century later, recurrent erosions are acute disruptions of the corneal epithelium, which classically occur upon awakening and are associated with severe, sharp pain that may be transient or last for several hours or days, depending upon the surface area of epithelial sloughing. In severe cases, the erosion syndrome may be associated with considerable morbidity and occupational disability. 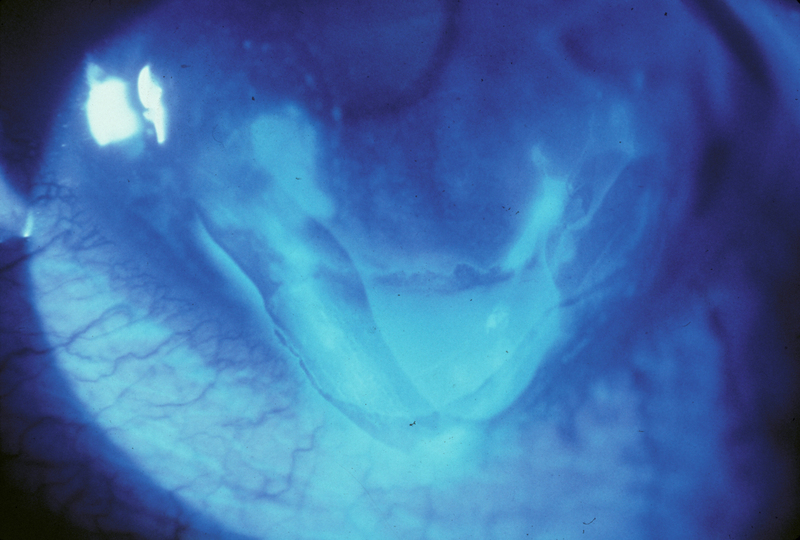 Although erosions may occur in association with prior corneal trauma, EBMD is the most common cause of this disorder. Initially, there may be few clinical signs associated with EBMD; however, a history of recurrent erosions should suggest this diagnosis, especially if they are bilateral and occur in multiple sites. With continued cycles of epithelial breakdown and aborted efforts at the development of a stable epithelial basement membrane adhesion complex, morphological changes eventually develop, which lead to the classic "map-dot-fingerprint" epithelial and subepithelial findings that characterize this disorder (Figures 1-3). Inadequate formation of hemidesmosomes by the basal epithelial cells results in compensatory aberrant regeneration and duplication of the epithelial basement membrane, a change that is clinically manifested by the "fingerprint" lines. The deposition of fibrogranular material below and above the abnormal basement membrane is responsible for the "map" and "dot" findings, respectively. 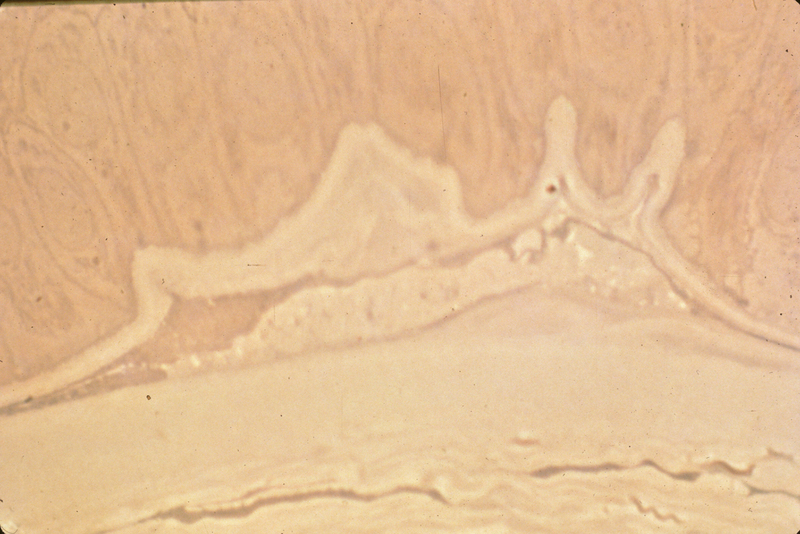 When present in the visual axis, these epithelial and subepithelial irregularities initially result in irregular astigmatism and induction of higher order optical aberrations, which are subjectively associated with monocular diplopia and visual distortion—often before the development of a decrease in Snellen acuity. However, a progressive decline in Snellen acuity does occur as the morphological abnormalities increase in density, often in association with a paradoxical improvement in the erosion syndrome. Figure 1. Epithelial basement membrane dystrophy: "map" changes. (A) Clinical appearance. (B) Duplication of the basement membrane correlates with the clinical findings. Figure 2. Epithelial basement membrane dystrophy: "dot" changes. (A) Clinical appearance. (B) Intraepithelial deposition of fibrillar material correlates with the clinical findings. Figure 3. Epithelial basement membrane dystrophy: "fingerprint" changes. (A) These changes are easily seen by retroillumination. (B) Duplication of the epithelial basement membrane correlates with the clinical findings. Successful treatment of EBMD is predicated upon optimizing conditions necessary for the formation of stable epithelial basement membrane adhesion complexes throughout the entire cornea, preferably before the development of vision-compromising morphological abnormalities in the visual axis. In most cases of EBMD, recurrent epithelial erosions can be prevented by the bedtime application of a lubricating or hyperosmotic ointment. If mild erosions frequently occur despite bedtime lubrication, the prolonged use of a bandage soft contact lens (SCL) may eliminate or greatly reduce the frequency of symptomatic erosions. Figure 4. Recurrent corneal epithelial erosions. (A) Small areas of epithelial loss with adjacent areas of rapid tear film breakup associated with poorly adherent corneal epithelium in the axial cornea. 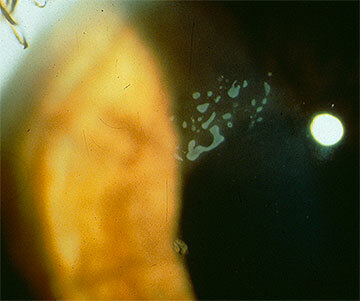 (B) Large area of poor adhesion with pseudobullous elevation of the corneal epithelium in the peripheral cornea. Epithelial debridement. For more than a century, the treatment of choice for recurrent erosions was the simple debridement of devitalized and poorly adherent epithelium and the use of pressure patching until reepithelialization was complete. Although the prolonged subsequent use of bedtime lubricating ointments subsequently resulted in permanent resolution in many cases, recurrent disease remained quite common. In 1983, Buxton and Fox reported a success rate of 85% with epithelial debridement followed by the extended use of bandage SCL therapy, which facilitated the uninterrupted development of a stable epithelial basement membrane adhesion complex. Removal of aberrant basement membrane and subepithelial debris and fibrosis. Simple epithelial debridement may not be effective in removing all the abnormal basement membrane and may be associated with the recurrence of epithelial erosions even after the discontinuation of extended bandage SCL therapy. As early as 1906, Franke reported a reduced rate of recurrent epithelial erosions when epithelial debridement was followed by the application of chlorinated water. Kenyon and Wagoner[2,8] further emphasized the importance of meticulously cleaning the subepithelial debris as an integral part of the management of this disorder. Disruption of Bowman's layer. 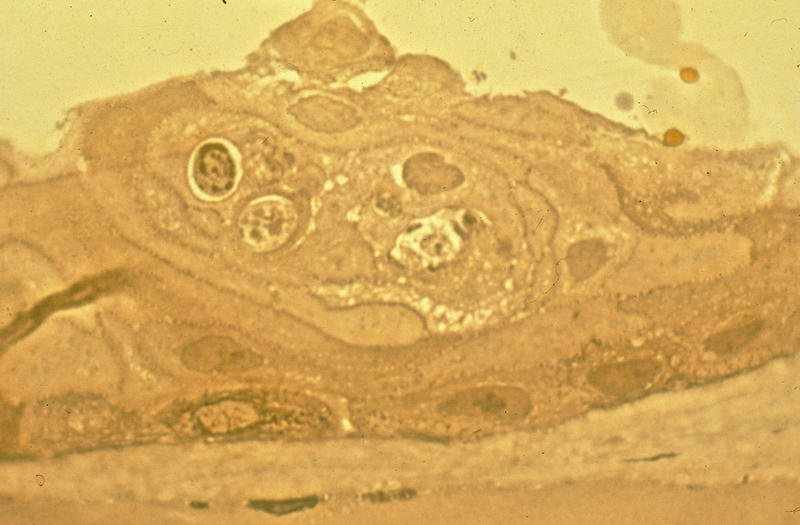 Brown and Bron suggested that some disruption of Bowman's layer may be necessary to maximize the opportunity for permanent resolution of recalcitrant epithelial erosions. Anecdotally, it has long been recognized that substantial trauma to Bowman's layer is associated not only with scarring but also with excellent epithelial adhesion. Accordingly, the guiding principle in managing recalcitrant erosions is striking an appropriate balance between sufficient disruption of Bowman's layer to facilitate firm epithelial adhesion and minimization of visually significant scarring. Broad area treatment of Bowman's layer with iodine was reported by Thygeson in 1954, with diathermy by Wood in 1984, with a diamond burr by Buxton and Constad in 1987, with the neodymium:YAG laser by Geggel in 1990, and subsequently with excimer laser phototherapeutic keratectomy (PTK) by numerous authors. [12,13] Focal disruption of Bowman's layer with anterior stromal puncture was demonstrated by McLean et al. to be effective in the management of most cases of recurrent erosion. 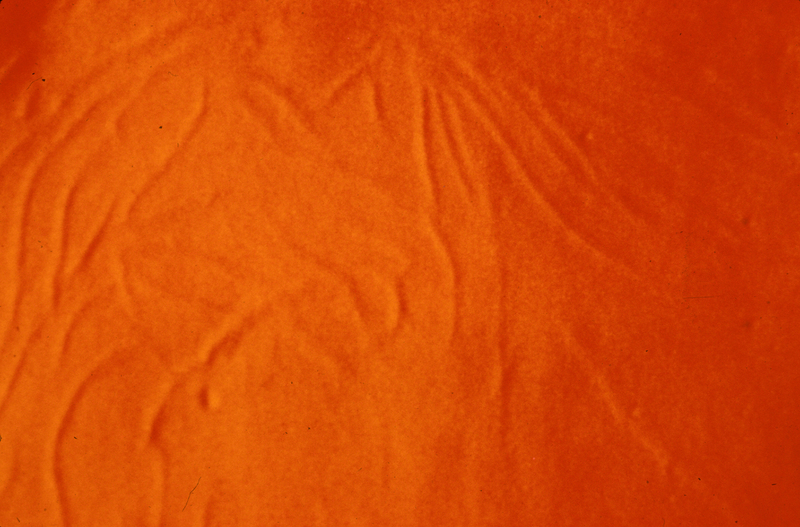 Although the anterior stromal puncture marks do not seem to be visually compromising, most authors recommend applying this technique aggressively outside the visual axis and either sparingly or not at all in the visual axis. Pharmacological control of matrix metalloproteinase-9. The manual SK techniques of epithelial debridement, removal of aberrant basement membrane and subepithelial debris, and focal disruption of Bowman's layer with stromal puncture, followed by a 6-to-12-week period of bandage SCL therapy, are almost invariably associated with the reestablishment of a firmly adherent corneal epithelium that tends to remain optically clear. However, this outcome is optimized by providing pharmacological intervention that is designed to minimize subepithelial collagenase production and its deleterious impact on the development of the stable epithelial basement membrane adhesion complex during the postoperative period. Durson et al. documented the efficacy of the systemic administration of doxycycline and the topical use of corticosteroids in further improving therapeutic outcomes associated with the medical and surgical management of recurrent erosion syndromes. In the present study, we reviewed the outcome of treating symptomatic EBMD with manual SK at University of Iowa Hospitals and Clinics (UIHC). The medical records of every patient with EBMD who had been treated with manual SK by a member of the Cornea Service at UIHC from January 1, 1998, to December 31, 2007, were retrospectively reviewed. The diagnosis was established by a member of the cornea faculty on the basis of the characteristic clinical findings. Every eye had been treated with at least one mode of medical therapy before undergoing SK, including the use of topical lubrication, hyperosmotic agents, and/or bandage SCL therapy. The indications for surgical intervention were decreased vision and/or recurrent corneal epithelial erosions. Outcome measures included best spectacle-corrected visual acuity (BSCVA), the presence or absence of recurrent erosions, and symptomatic recurrent EBMD. Cases in which more than 3 months of postoperative follow-up were available were included in the statistical analysis. Eyes that had been previously treated with either manual SK or PTK prior to referral to UIHC or before the study period were excluded from the statistical analysis. The surgical procedures were performed with topical anesthesia by members of the cornea faculty (KMG, JES, MDW) in the minor outpatient procedure room. The central corneal epithelium (6.0-8.0 mm) was debrided with a Weck cell sponge in most cases. Occasionally, a no. 57 Beaver blade was required to complete the epithelial removal. Poorly adherent epithelium in the periphery was also debrided when present. A no. 57 Beaver blade was also used to remove the basement membrane and subepithelial fibrosis with gentle scraping. Special precautions were taken to minimize the disturbance of the underlying Bowman's layer. 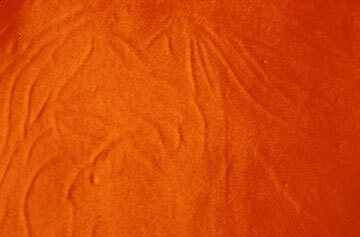 The surface of Bowman's layer was then vigorously smoothed with a Weck cell sponge. In some cases early in the study period, a diamond burr was gently applied to the anterior surface of Bowman's layer. 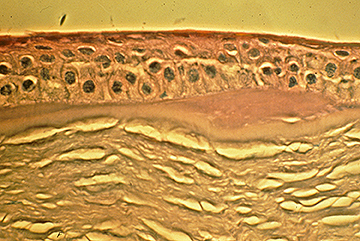 Later in the study period, stromal puncture was directly applied to Bowman's layer outside the visual axis where the epithelium had been debrided and through the epithelium in areas where it remained in place. One surgeon (MDW) applied light treatment in the visual axis in cases where erosions had been documented to occur in this zone or where substantial subepithelial fibrosis had been detected prior to the operative procedure. At the conclusion of the case, a bandage SCL was placed on the eye. Postoperatively, all patients were treated with topical antibiotics and steroid drops 4 times daily for 1 week. Early in the study period, the bandage SCL therapy was discontinued in most cases after 1 week, the topical antibiotics and steroids were rapidly tapered and discontinued, and bedtime lubricating ointment was continued for at least 3 months. Later in the study period, the bandage SCL therapy was continued for 6 to 12 weeks in most cases, along with the administration of prophylactic topical antibiotics. In the latter half of the study, most patients were concomitantly treated with systemic doxycycline and topical corticosteroids until the bandage SCL therapy was completed. Of 20 patients (14 men; 6 women), 22 eyes with EBMD were treated with manual SK for decreased vision (20 eyes) and/or recurrent epithelial erosions (15 eyes). The mean follow-up after surgery was 43.6 months (range, 3.0-115.2 months). The treatment outcomes for decreased visual acuity are summarized in Table 1. Improvement was detected in BSCVA from a mean preoperative logMAR acuity of 0.313 (Snellen equivalent 20/41) to a best postoperative acuity of 0.038 (20/22) and a final acuity of 0.079 (20/24). A BSCVA of 20/20 or better was achieved in 12 (60.0%) eyes, and the same result was achieved at the most recent examination in 10 (50.0%) eyes. A BSCVA of 20/30 or better was achieved in 20 (100.0%) eyes, and the same result was achieved at the most recent examination in 19 (95.0%) eyes. All 15 (100.0%) eyes with recurrent erosions had complete resolution of symptoms during the first 6 postoperative months. Between 6 and 60 months after initial treatment, 3 (20.0%) eyes experienced recurrent erosions. Among these, 2 eyes were successfully treated with a course of bandage SCL therapy, and 1 eye was successfully treated with excimer laser PTK. No surgical complications resulted from any of the manual SK procedures. Our study strongly suggests that manual SK is a safe and effective treatment for visual disturbances and recurrent epithelial erosions associated with EBMD. No complications occurred in any of the 22 eyes treated with manual SK. Furthermore, all 20 eyes treated for visual disturbances experienced a sustained improvement in vision for the entire follow-up period. 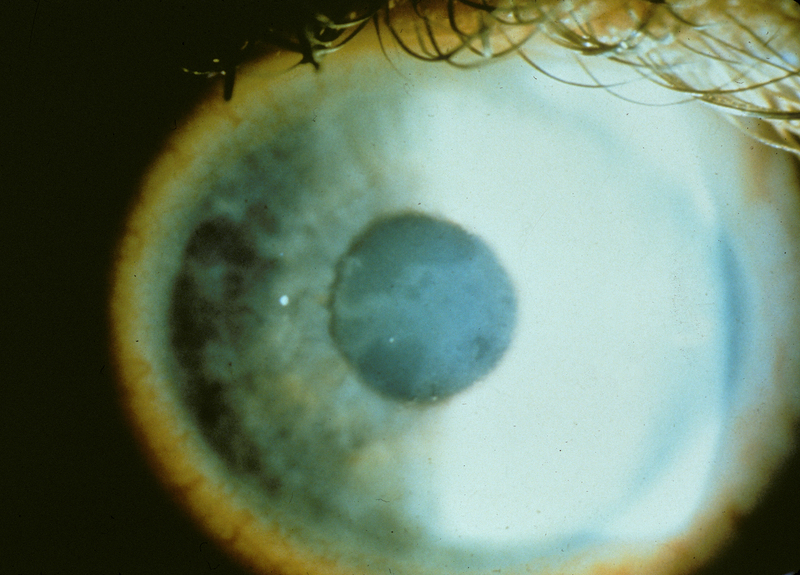 Although it would be intuitive to anticipate that the same morphological abnormalities would occur postoperatively in this genetic disorder, the establishment of stable epithelial basement membrane adhesion complexes and the reduction of recurrent epithelial erosions in the visual axis either completely prevents or substantially retards the recurrence of these changes and their adverse effects on visual function. Every patient experienced complete relief of recurrent erosion symptoms during the first 6 months, with only 3 experiencing symptoms in the subsequent decade. Among these, 2 cases were relatively minor and were managed with a 3-month course of bandage SCL therapy. One case was troublesome and required treatment of the entire basement membrane of the affected eye with excimer laser PTK. Obtaining a lasting and satisfactory result with manual SK requires meticulous attention to the surgical technique, especially the thorough removal of all abnormal subepithelial pathology in the visual axis and the use of anterior stromal puncture, prolonged postoperative bandage SCL therapy, and appropriate pharmacological support. This technique is effective in providing a sustained improvement in the spectacle acuity of virtually every patient and relief from recurrent erosions in the vast majority of patients. It is preferred over broad area ablation with the excimer laser because it is much less expensive, is not associated with a hyperopic shift in the baseline refractive error, and is less likely to induce visually significant haze in the visual axis (Table 2).12,13 Nonetheless, it will occasionally be necessary to offer excimer laser PTK to the small percentage of patients in which manual SK is not completely successful in providing sustained relief from recurrent erosions, as was the case with 1 patient in the present series. Excimer laser PTK may be offered in combination with photorefractive keratectomy (PRK) in primary therapy of EBMD if the therapeutic objective is to attain an improvement in uncorrected visual acuity. If this approach is adopted, the treating ophthalmologist must be cognizant of the potential that some of the measured refractive error may be factitiously induced by the epithelial and subepithelial morphological abnormalities associated with EBMD and that the refractive accuracy of PRK cannot be predicted with certainty. In such cases, a more conservative approach would be to perform a 2-stage procedure consisting of manual SK followed by PRK (after the refractive error has stabilized and can be measured accurately). Waring GO 3rd, Rodriques MM, Laibson PR. Corneal dystrophies I. Dystrophies of the epithelium, Bowman's layer, and stroma. Surv Ophthalmol. 1978;23:71-122. Kenyon KR, Wagoner MD. Corneal epithelial defects and noninfectious ulceration. In: Albert DM, Jakobiec FA, eds. Principles and Practice of Ophthalmology. Vol 2. 2nd ed. Philadelphia, Pa: WB Saunders; 2000:926-943. Hansen E. Om den intermettirende keratitis vesiculosa neuralgica af traumatisk oprndelse. Hosp Tidende. 1872;15:201-203. Thygeson P. Observations on recurrent epithelial erosion of the cornea. Am J Ophthalmol. 1959;27:48-52. Buxton JN, Fox ML. Superficial keratectomy in the treatment of epithelial basement membrane dystrophy: a preliminary report. Arch Ophthalmol. 1983;101:392-395. Brown N, Bron A. Recurrent erosion of the cornea. Br J Ophthalmol. 1976;60:84-86. Franke E. Uber Erkrankungen des Epithels der Hornhaut. Klin Monastsbl Augenheilkd. 1906;44:508-532. Wagoner MD, Kenyon KR. Keratectomy and lamellar keratoplasty. In: Bruner WE, Stark WJ, Maumenee AE, eds. A Manual of Corneal Surgery. New York, NY: Churchill Livingstone; 1987:29-38. Wood TO. Recurrent erosion. Trans Am Ophthalmol Soc. 1984;82:850-898. Buxton JN, Constad WH. Superficial epithelial keratectomy in the treatment of epithelial basement membrane dystrophy. Ann Ophthalmol. 1987;19:92-96. Geggel HS. Successful treatment of recurrent corneal erosion with Nd:YAG anterior stromal puncture. Am J Ophthalmol. 1990;110:404-407. Hersh PS, Wagoner MD. Excimer Laser Surgery for Corneal Disorders. New York/Stuttgart: Thieme Medical Publishers; 1998. Hersh PS, Klein S, Wagoner MD. Phototherapeutic keratectomy. In: Krachmer JH, Mannis MJ, Holland EJ, eds. Cornea. Vol 2. 2nd ed. St Louis, Mo: Mosby; 2005: 1735-1747. McLean EN, MacRae SM, Rich LF. Recurrent erosion. Treatment by anterior stromal puncture. Ophthalmology. 1986;784-788. Dursun D, Kim MC, Solomon A, Pflugfelder SC. Treatment of recalcitrant recurrent corneal erosions with inhibitors of matrix metalloproteinase-9, doxycycline and corticosteroids. Am J Ophthalmol. 2001;132:8-13. Suggested citation format: Pham LTL, Goins, KM, Sutphin JE, Wagoner MD. Treatment of Epithelial Basement Membrane Dystrophy With Manual Superficial Keratectomy. EyeRounds.org. 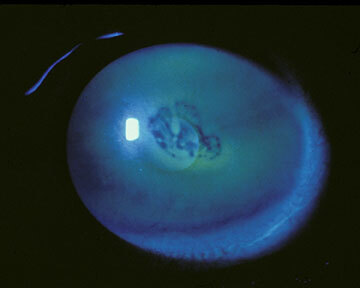 Feb 22, 2010; Available from: http://www.eyerounds.org/cases/78-EBMD-treatment.htm.